If you've ever been at a KISS concert, you know that standing in the crowd is half the fun. Fans really go all out, with face paint, costumes and even squeezing into those platform boots. Some people, with kids in tow and maybe some earplugs, make the concert a family affair. I had the chance to see KISS at Kewadin Casino in Sault Ste. Marie, MI, in July 2007. I wouldn't consider myself a KISS fan, but by the end of the night, I too began to Shout It Out Loud. KISS last performed in Sudbury as part of their Love Gun tour in the summer of 1977. The concert, like most of the band's antics back then, caused quite a stir in the city with some people protesting their appearance at the Sudbury Arena. KISS performs here next week as part of their 2013 Monster Tour -- almost 36 years to the date from their last appearance at the same arena. Local musician and devout KISS fan Chris "Pepper" Peplinski is one of the lucky ones who snagged a ticket for the sold-out event. "This will be my first time seeing them and I'm so freakin' excited," he says. The band was one of the first Peplinski started listening to as a child. 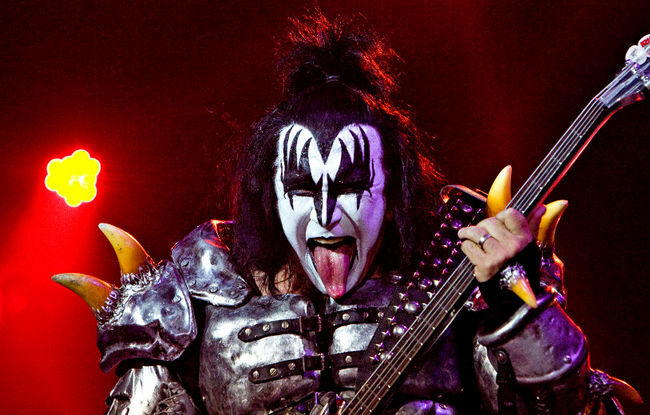 "When I was a kid, KISS was a combination of rock music and superheroes," says Peplinski. "To see these guys was like holding a comic book in your hand, but it was a record." His parents weren't too fond of his music choice, but neither were some kids in the schoolyard. "There was a point in time when you couldn't say you were a KISS fan because you'd get beat up," he says. "When I was in high school in the late '80s when hair metal was coming out, if you were a KISS fan, you'd get beat up by the Metallica fans." KISS wasn't the most talented band, says Peplinski, but their theatrical stage presence and a massive marketing push have made them legend. when he first listened to KISS and he likened the group to musical superheroes. "I remember thinking, that while I knew that KISS were real human beings despite their heavily made-up characters, I kind of hoped that they weren't in some weird way -- it was all part of the KISS escapist fantasy," he says. In his book, Jensen details the influence KISS had on his life growing up in the small town of Espanola, and how he felt when meeting Gene Simmons in person. While his mom thought KISS was the devil's music, she was supportive and bought many of the albums for him. "We had an understanding -- I got to listen to KISS records as long as the volume on the stereo stayed at a respectable level and I didn't ever try to breathe fire," he says. Looking back, Jensen realizes that KISS is more of a business than a band, but as a child "I felt like KISS belonged to me." Part of this magic was the band's ability to "emotionally imprint themselves" on young impressionable fans. "They exploited the fantasy element with an aggressive marketing campaign in the '70s with the lunch boxes and everything for kids my age back then, and they've been selling us a nostalgia-fueled recreation of that experience years and years after the fact," said Jensen. "They'll continue to do so, and we'll continue to buy it. The cult of KISS is so alluring because for the price of a concert ticket, they're selling our childhoods back to us, over and over again.